Contested Ground took place at 176 over two days in January 2009 as part of Testing Ground: Curating. This month-long experiment sought to engage with the practice of curating in three specific artistic registers: the performing arts, curatorial training programmes and the secondary school teaching of photography, textiles and graphics. These projects resulted in the intensive production and presentation of three public events at 176 over the course of three weeks. The Magic, an evening of music, dance and live film curated by singer-songwriter Lail Arad, tested the boundaries between the performing arts and performance art. Deconstruct/Reconstruct was the culmination of a process that involved the curators at 176 mentoring a group of year 12 secondary school students through the production and exhibition of new works, and introduced a generation of young art students to the practice of curating. In the narrative arc of Contested Ground, what began as a modest proposal to students on the two most established curatorial training programmes in London – the MA in Curating Contemporary Art at the Royal College of Art and the MFA in Curating at Goldsmiths College – rapidly took on a life of its own as the forces of ambition and competition came into play. The resulting two days of exhibitions, performances and events were attended by more than 800 people. The initial brief to the students of the two courses was to programme a public event – for example an artist’s talk or screening – during the weekend of January 17/18. 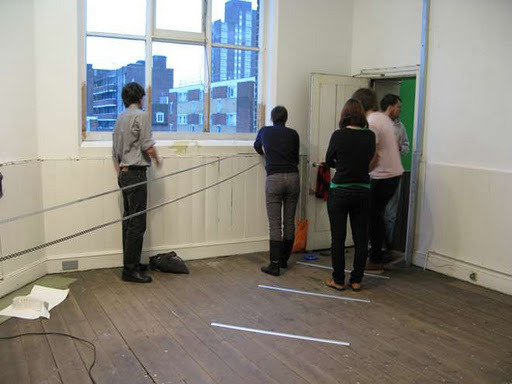 We extended that initial invitation in late October 2008, and in the 12 weeks between that time and the public presentation of Contested Ground, the project grew, well beyond our initial expectations, to involve 30 curating students and more than 35 artists and collectives in some 17 discrete events and over 10 different curated displays. In terms of resources, the students were offered the building at 176, a former Methodist chapel with 1,000 square metres of exhibition space; curatorial support from the team at the gallery; and a promotional campaign for the event, conducted through the press and marketing channels used by 176. One caveat in the brief was that the event would in no way be funded by 176, hence the modesty of our initial proposal. The curators of Testing Ground were invited to figure out the event’s economics and budget for themselves. Contested Ground was not simply an exercise in fulfilling lavish ambitions with frugal means; its underlying pedagogical motivation was to introduce the students to the practice of curating in an active and independent institution; one which operates within its own unique set of circumstances and provides an unusual institutional framework. As a privately funded public space, linked to the Zabludowicz Collection of contemporary art, 176 enjoys a relative freedom in terms of its programming. In other words, its independence from public sources of funding allows it to take on projects at short notice, sidestepping time-consuming bureaucratic procedures, and to take risks in producing large-scale artworks and exhibitions. This freedom lends the process of exhibition-making at 176 an intuitive air and allows for an open-ended approach to projects. However, it also demands a sustained critical and analytical stance from the curatorial team at 176 with regard to its own programming and status in relation to other types of public and private art institutions. During the debrief for Contested Ground, the most common comment from the students involved in the project was a retroactive wish to have received a more stringent brief for the project. But delivering an overall vision for the event from the outset would have risked hindering the open-ended and experimental nature of the project, which in many ways enabled its ambitious scope to emerge and contributed to its eventual success. Paradoxically, the fact that Contested Ground teetered on the edge of being overprogrammed, or of repelling audiences with an excess of options, is one of the things that made it so successful. Post hoc publications such as this zine, which has come out of the printed material generated during and after the weekend, allow an engagement with the tangled legacy of such an intensive moment of production. They allow us to eke out the strands that made it such a success, and to reel in those that threatened to lead it astray.